Three leather floggers with nice handles. A handle is an appendage to an object to be held in one's hand in order to use or move it. Most spanking implements have a handle, or at least an end that is naturally used as a handle. The handle is usually made from the same material as the "business end" of the implement. Optionally, it can be brushed up with additional material, for a better handle shape and/or feel. Shape a) may break easily, shape b) is stronger. The part of the implement that is in highest danger of breaking is often the part where the handle joins the business end. This part should never be made weak. 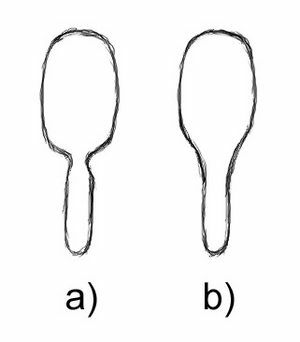 A shape such as a) in the figure to the right may look nicer, but a shape such as b) is strong where it is important, and much less likely to break. If the implement is floppy (e.g. a strap, tawse or leather paddle), it may also be desireable to stiffen it somewhat at the part where the handle joins the business end, for example, with an interior spine if it is double-layered. Alternatively, the spanker can also put one or two fingers on the flap for floppiness control. An unusual cane manufactured from lexan.